One of the city’s youngest landmarks is gearing up for a facelift. The Olayan Group wants to spruce up the street-level design of 550 Madison Avenue, formerly known as the Sony Building, which it purchased for $1.4 billion in 2016. 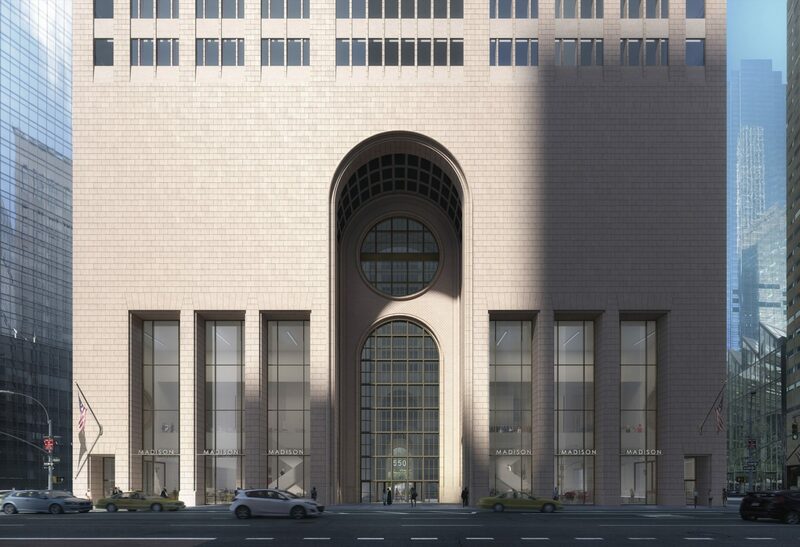 Hoping to make the imposing lower façade—which features large swaths of stone broken up by just a few cavernous openings—a bit more inviting, the Saudi conglomerate wants to outfit the 35-year-old building with new windows and reimagined retail spaces. Olayan plans to renovate the open space behind 550 Madison Avenue with a new, painted steel canopy. the public space behind the building, expanding it to 21,300 s/f with 42 trees, eight bike racks, seven restrooms and planters covering 45 percent of the space. The area also will get a painted steel canopy. The aesthetic tweaks are part of a greater effort to improve the functionality of the building as Olayan prepares to reintroduce it to the market and compete with new, ground-up developments popping up in Hudson Yards and the Financial District. To do that, the group is orchestrating a number of interior renovations, which are being handled by AECOM Tishman, including adding new elevators, air filters and a distributed antenna system for in-building wireless. The firms are targeting LEED platinum status, as well as Wired and WELL certifications. All of the interior work can be handled as-of-right but to address the exterior, the group needs the OK from the city’s Landmarks Preservation Commission. The first step down that path is a presentation to Community Board 5, set to take place this week. Snohetta hopes to make the retail portion of 550 Madison more inviting by adding new glass and illuminating once-dark portions of the building. Planned changes are relatively minor. Snøhetta, the architecture firm behind the renovations, wants to move the main windows back from the street and outfit them with fewer mullions for greater visibility. It also will add entrances to the two retail spaces directly from Madison Avenue, rather making shoppers go in through the main entrance. Snøhetta also plans to create retail spaces along the sides of the building, which are open but currently serve little purpose besides funneling wind and capturing refuse. The north and south sides of the building each feature a series of circular openings for the building’s mechanical structures but that machinery will be moved and those openings, too, will be covered by glass. Nick Anderson, a project manager and senior architect at Snøhetta, said proposed changes would have little impact on the building’s historic features, namely its iconic “Chippendale” roof and its pink granite skin. “This was one of the first masonry postmodern skyscrapers in the world,” said. “It really thumbed its nose at the high modernism movement at the time, in which everything had a lot of glass and steel. CBRE, which is representing Olayan, has already started reaching out to new office tenants, Horvat said, adding that once the proposal gets the OK from its local community board, the company hopes to take it to the city next month.